As promised, here’s an updated on the socks for #1 Son. I’ve just started the gusset increases. 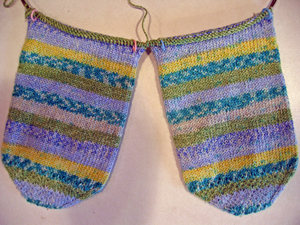 You can see the stitch markers to either side of what will be the center of the sock. #1 Son thinks that pairs of socks with different stripes are cute (and I agree with him). So thinking that the stocks would stripe differently and randomly, I made no attempt to match the yarn up. I just grabbed the ends from the center of each ball and started knitting. Meilenweit outsmarted me by having the skeins start and end at exactly the same place in the color repeat. These are in Meilenweit Cotton Fantasy #801 on Addi Turbo US#1 needles. The toe is in Eye of Partridge stitch. I’m working the foot in plain garter. The heel will be Eye of Partridge. I haven’t decided on the ankle, yet. It will probably be something simple, like 4×2 ribbing.